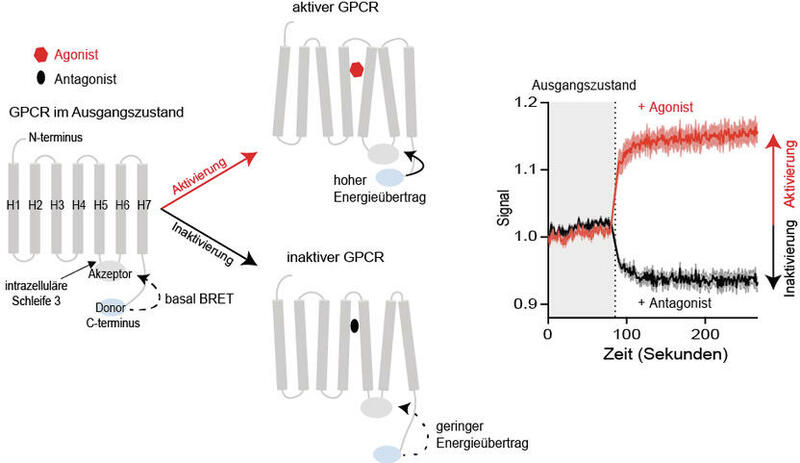 Novel sensors make it possible to measure the activation or deactivation of GPCRs with high-throughput methods. 07-Sep-2018: Hormones and other neurotransmitters, but also drugs, act upon receptors. “Their active substances bind to the receptors and modify the three-dimensional receptor arrangement regulating the downstream signal pathways,” says Hannes Schihada from the Institute for Pharmacology and Toxicology at the University of Würzburg (JMU). A special case are G protein–coupled receptors (GPCR). “About 30 percent of all authorized drugs worldwide act upon these receptors,” explains Hannes Schihada, “but their potential is not yet fully utilized.” So far, it was not possible to test the effect of millions of potential drugs on the GPCR arrangement within a very short time. “This has been a stumbling block to the discovery of novel pharmaceutical substances and the research of still unknown GPCRs,” says Dr. Isabella Maiellaro, who is in charge of the project together with Professor Martin Lohse. The JMU team has now developed a method that allows the determination of both activity and potency of GPCR ligands in living cells using high throughput technology. The name of the method is BRET (bioluminescence resonance energy transfer-based sensor design). “It can be used not only for GPCRs but for a lot of different biomolecules,” explains Schihada. The universal sensor design now allows the exploration of receptor conformational changes in living cells with the high-throughput method. This enables a much faster pharmacological characterization by a high number of test combounds that directly act on the receptor, independently of their downstream receptor signal pathways. “This technology can contribute to a faster and better understanding of the different levels of effectiveness of drugs and thus drive the development of novel therapeutic concepts,” says Schihada. The study of novel receptor targets will yield a higher array to develop drugs that have less side-effects and are more efficient. 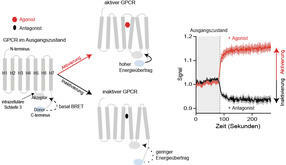 Furthermore, the sensors could help to better understand what is called orphan GPCRs – GPCRs whose function and ligands are still largely unknown. “With these findings we can lay the foundation for the treatment of severe diseases that were hitherto difficult to treat, such as Alzheimer’s or multiple sclerosis,” says the scientist. The research has been funded by the Federal Ministry for Education and Research. The scientists now want to expand their range of sensors suitable for high throughput.